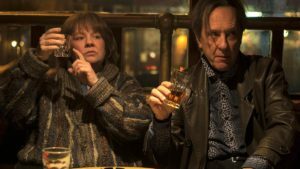 Movie Review: Can You Ever Forgive Me? The story of Lee Israel–the infamous forger of literary letters back in the early 1990s–is wildly fascinating. A published author in financial binds, social reclusivity, and an alcohol-fueled downward spiral, Lee finds a way to free herself through white-collar crime. How Lee did what she did and why were detailed in her memoir Can You Ever Forgive Me? adapted into a film of the same name. 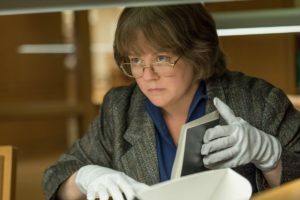 Starring Melissa McCarthy, Can You Ever Forgive Me? takes a hard look at Lee’s circumstances, her complexities and flaws, and the gray areas between justice, greed, and survival. It’s no secret Melissa McCarthy has a dynamic range–even in her comedic acting. She’s shown time and time again that she can find new ranges and characters to explore, whether it be Sean Spicer, a domineering-yet-bankrupt boss, or an out-to-lunch identity thief. 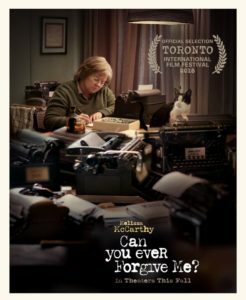 In Can You Forgive Me?, shSe blows her past work out of the water in possibly the most incredible role of her career to date. There is zero reason for us, the audience, to connect with Lee on any level. Yet somehow, McCarthy manages to make her more endearing to us. While a much more serious character than any McCarthy has played so far, there is humor in Lee. And, it’s delivered so well at the right points. This, combined with the raw honesty of the character, is what I think makes her ultimately likable for audiences. Can You Ever Forgive Me? holds no punches, especially with Lee. We don’t get to see a version of the character that’s been curated to make her sympathetic; indeed, some people may find Lee disturbing and/or revolting. I don’t blame them. In fact, I credit the incredible crafting done by McCarthy and the filmmakers to bring Lee into three dimensions on-screen. To see her wholly as good or bad, though, is to ignore reality–that Lee (like ourselves) contains multitudes. Seriously, there were points where McCarthy just slipped into this role so well she disappeared. To that end, McCarthy’s portrayal of Lee is a common touch-point between the audience and the film’s narrative. Through Lee, Can You Ever Forgive Me? explores what it means to be human, in all its entirety. Like Lee, some of us may become reclusive and mean-spirited towards others, while still showing affection to select people we know and our pets. Many of us have also found ourselves in situations where our needs are in strict juxtaposition with our ethics, and in trying to resolve that tension, we mess up big-time. And there are definitely some who–after they have messed up–don’t necessarily feel bad for what they’ve done, and not because they don’t feel remorse at all. Rather, the experience they went through was valuable, and they respect that. Seriously, who doesn’t want a film you can see yourself in? Even if it’s more dramatic and dark than a popcorn flick, isn’t it nice to connect with a piece of art on a deeper level for a change? Two of the great triumphs of Can You Ever Forgive Me? 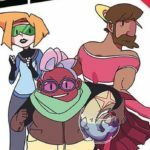 are how it manages the balance of its tones and dealing with the New York City of the early 1990s. The film strikes a very cynical tone with an earnest heart beating just beneath it. As much as it is a story about a woman committing a crime, it is also political in nature. Time and time again, it goes after power, trying to pull it down. Between Lee’s constant confrontations and subsequent trolling of her editor and her almost sheer glee in ripping off some of her buyers, her moral compass is much aligned with anti-establishment sentiments that our culture still echoes today. The audience revels in Lee’s feelings because her terminal case of Stick-it-to-the-man-neosis is something we love to watch. One of the best moments of this is at the end, where she finds an antiquities dealer selling one of her forgeries. The guy is hocking one of her Dorothy Parker letters for a ridiculous up-sell. She ends up sending another letter written as Dorothy Parker to the dealer, letting him know the one he’s trying to sell is fake. It’s an awesome gotcha! moment. It is short-lived, unfortunately. At the end of the film–despite Lee’s earnestness and desire to right systemic wrongs–we are slapped in the face with the cynical nature of capitalism. The dealer she tips off in the end invariably ends up keeping the letter up in the window of his shop–an unscrupulous move that reminds us the house always wins. The film, for all its triumph in moving Lee to a point where she’s ready to find her creative voice for real, reminds us that she is powerless against the very system that created her. While this is a bleak reminder of our own lack of power, it’s also a sobering reminder of what it takes to make systemic change happen. If there truly is a moral to Lee’s story, it’s that participation or resistance alone within an unjust system are not enough to shift the balances of power–more is required. Can You Ever Forgive Me? has a massive cloud hanging over it: the AIDS epidemic. By the time of Lee’s career as a forger, AIDS was at its peak destructiveness in NYC. By 1995, it would become the leading cause of death for all Americans between the ages of 25 to 44. This reality is woven into the fabric of that city and would have been tied to the true Lee Israel’s experience in multiple ways. However, this bleak reality–while bubbling under the surface of this film–remains in the background until the very last scenes of the movie. Lee’s friend and actual (albeit brief) partner-in-crime, Jack Hock (Richard E. Grant), visits with Lee at the end of the film. We learn he’s contracted AIDS and is in poor health. From the start of the film, we know Jack is gay and promiscuous. Knowing what we know in our present age, immediate dramatic irony and tension arise from the moment we meet him. However, his storyline isn’t focused on the disease, his struggle with it, or any other stereotypical narrative for gay characters of that time. Rather, our frame of reference is purely his relationship with Lee and the continued hardships of his Bohemian life. We end up forgetting almost completely about the historical context in which he’s living. These two are magic together on-screen. Lee’s story and Jack’s illness/demise are ultimately tied together; therefore, to not acknowledge the epidemic would be akin to erasing history. Saving it until the end of the film was–in my opinion–a brilliant move. We see Jack independent of the archetypal LGBT-AIDS-sufferer narrative our culture has built. This is not to say those narratives are not important, but so often that’s all we get from LGBT characters of this time. Seeing these characters as we see Lee–who still has her own separate struggles as a lesbian in NYC–makes them more real and complete. The Plight of the Creative: Too Simplified? 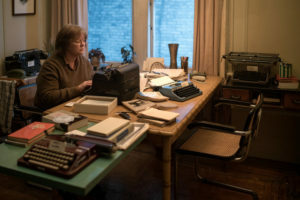 If there’s one critique I’d have to level at Can You Ever Forgive Me?, it’s the simplified narrative thread they give to Lee’s character. Simply put: by keeping herself hidden behind other people’s voices, Lee causes her own problems. Her editor basically tells her that if she can “find her voice” then maybe she’d have a shot at getting another book deal. We then see this pay off in the end, when we watch the title cards at the end of the film state how Lee’s memoir got all this critical acclaim. It’s implied her eventual success depended on discovering her voice, and that it was necessary for her to struggle first. As a writer, this rubs me the wrong way. I have many gripes about this, but most critical is the invocation of antiquated tropes about artists/creators. A long-standing asceticism has pervaded our culture, clouding our heads with the idea that artists must suffer for their work. This goes hand-in-hand with the notion of artists as “broken” and the continuous conflation of mental illness with creativity. Certainly, I’m not going to argue that suffering doesn’t translate into beautiful art, or that persons with mental illness can gravitate toward creative endeavors. Yet, the whole notion of suffering and hardship–to me–is disingenuous. Artists definitely suffer, but we all suffer. As far as I can tell, there’s nothing inherent about an artist’s hardships that necessarily leads to great art. Lee worked damn-hard on her forgeries, and that hard work was communicated so well throughout the film. Now, what I found most endearing in Can You Ever Forgive Me? was Lee’s pride in her forgeries. She put a lot of hard work into them, and they really were works of genius. It is true she was hiding herself behind other people’s voices; however, the effort she put into her creations fooled even the most well-trained expert (one forgery was actually included in–and then redacted from–a biography). That work ethic and pride is essentially swept under the rug in favor of this “find your voice” message. A little too saccharine for Lee Israel, in my opinion. Now, I have not read the actual memoir, so it’s possible Lee espouses this narrative thread in her work. Given everything we know about her though, I take that message as disingenuous, at best. Hell, in the last scene of the film, she laughs at her friend who’s dying of AIDS. This simplified narrative and Lee as a character don’t seem to vibe. But again, maybe I’m wrong. If I am… can you ever forgive me? You guys, seriously–Can You Ever Forgive Me? is a great film. Smaller-scale awards have already nodded at Melissa McCarthy for her portrayal of Lee Israel, and she definitely deserves at least an Oscar nod. And, while the tone of this film is dark and cynical, it doesn’t leave you hopeless. You might come out of the theater feeling a little weird, but I think you’ll enjoy the ride.